Duval Fence Company provides only the highest quality commercial chain link fences to the Jacksonville and surronding Duval County area including Orange Park, Mandarin, Arlington, Jacksonville Beaches, Ponte Vedra, St. Augustine, Duval County, Clay County and St. Johns County. 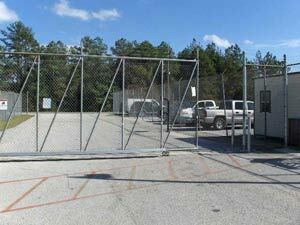 Why whould you want to have a chain link fence installed on your commercial property? As an additional purpose these fences can be converted into security gates with manual entry of the use of a keypad. Contact Duval Fence today (904) 260-4747 or by email to get a free estimate on a new chain link fence!